During route asphalt covering is 3 km of road, gravel covering – 32km, the improved dirt road-19km and a dirt road – 3km. A relief is equal. Complexities can arise because of a strong wind when it blows from outside Lubāns lakes or towards surmountable route. During rain or some time after a strong and long downpour it is difficult to go, there can be improved roads. Any person who does not have other physical activity can overcome a route. Also children at the age from 10 years can overcome it. Problems can arise during or after rain, when separate roads of route are soaked, and also during wind. It is difficult to predict, what time will occupy this route. It depends on speed of movement, duration and frequency of rest and quality of roads. It is necessary to consider that buy products and essential commodities it is possible only in Nagli. It is impossible to get bicycle details here and it will be necessary to take it with you. You can spend the night in rest house „Zvejnieki” and in the rural house „Paeglīši” in Ideni. In the middle of Kvapanu pond is situated rest house „Birzes”. If you want to spend the night on the nature then it is possible to offer a camping „Dimanti”. It is possible to put tent near Information Tourist Centre Lubāns. Then it is possible to settle down in a new camping near Kvāpānu ponds. Lubāns – the biggest lake in Latvia. Its area is 80,7 km2, with the islands 82,1 km2. Length of the lake Lubāns reaches 14 km, width – to 9 km, but the average depth is just 1,6 m. To tell the truth, nowadays only small part of the former lake Lubāns can be “seen” because due to natural conditions and such caused by people multiple decrease of water level has happened. In olden times area of the lake had reached maximum 700 km2. Former the lake Lubāns flooded large areas in springs. In the book “Mazās piezīmes” [small remarks] author Kārlis Skalbe describes the impressive floods of the lake Lubāns in the twentieth of last century. To comprehend the volume of the floods it is advisable before the tour to read the description in the mentioned book. On this account restructuring work of the bank and surroundings was done in the thirtieth and fiftieth-seventieth of the 20th century by creating a dike system, sluice, polders and other hydrotechnical buildings. Rare hydrologic phenomenon was connected with the lake Lubāns and the river Aiviekste sluicing from the north part of the lake till the lake was diked in: in strong floods the water of the river Aiviekste and rivers discharging into it– Iča, Balupe and partially Pededze – flew not downstream, but back to the lake Lubāns because the slope of the rivers in the plain of Lubāns was small. The lake Lubāns with the adjacent marshes, meadows – former flat valleys and ponds that are an important birds resting and nesting ground, is a wetland of European importance. In 2009 Lubāns wetland nature restricted area was founded. It contains the former nature restricted areas – Īdiņi marsh, Īdeņa and Kvāpāni ponds, Lubāns and Sūļagala marsh, Pārbaine, Sala marsh, Teirumnīki (Tīrumnieki) marsh, Salenieki marsh, lowland of Lubāna, etc. The restricted area is the territory of Natura 2000 and it is created to ensure joint protection of Latvian largest inland wetlands complex. The restricted area with acreage of 51 632 ha is a unique European and world nature complex with outstanding importance for preservation of many particularly protected species populations and preservation of biotopes. The lake Lubāns and fish ponds are one of the most important resting and feeding grounds of crossing migrating water birds in the country, and also one of five best nesting grounds for 48 European endangered bird species. 4 bird species – white-tailed eagle, greater spotted eagle, snipe and corncrake are included in the list of world’s endangered bird species. Totally 225 bird species are observed in the territory, 187 of them nest here. Five observation towers and one platform are built around the lake Lubāns to observe the birds but the below mentioned tourism information centre was created to obtain information (tel.29234956). It is advisable to begin the cycle tour around the lake Lubāns from the Lubāns wetland Tourism information centre that was built in 2007. This centre is built at the lake Lubāns and source of the river Aiviekste. Here the visitors can receive information on the nature values in the territory of wetland and offer of neighbourhood tourism. Here is a parking-place where you can conveniently leave the car and also possibilities to stay overnight. We begin the route in direction of Gaigalava. Here the road curls along the very margin of the lake and here are the best places to approach the lake. Here are fitted bathing-grounds with firm and sandy bank and bed. In the further way access to the lake and finding a good bathing-ground is difficult. After short 1,5 km we reach Gūmeļš bird observation tower that is the first one in our tour. When getting on the tower on the right you can see the lake Lubāns, but on the left the lake Gūmelis that actually is a creek of Lubāns and in the result of dam construction was completely separated from the lake. Water level in the lake Gūmelis is lower than in the lake and ranges depending on the level of flood and precipitation. In a way here you can see the landscape what the lake Lubāns was before the limitation by dams. Having managed 4,5 km from the start point we arrive at a campsite that was built by the means of EU within the framework of Latvia-Lithuania cross-border project. The campsite is located on the left side of the road at the ponds of Kvāpāni. Ponds Kvāpāni is an artificial reservoir system created for fish farm needs consisting of five ponds. Total area is 6,26 km2. The ponds are delimited with dams. Dam on that is the Lubāna-Gaigalava motorway separates the ponds from the river Rēzekne and the lake Lubāns. Pond system was created within the period from 1965 to1980. After something over 0,5 km we arrive at the mouth of the river Rēzekne into the lake Lubāns. Length of the river Rēzekne reaches 116 km. From Rikava parish Murāni the river is controlled. Ponds formed on the riversides are filled with waters from the river Malta, but water from the ponds is discharged into the river Rēzekne. Bellow the ponds Orenīši water from the river Malta is delivered in the river through a channel whereby the outlet and reservoir of the river Rēzekne is doubled. From Žogotas to the lake Lubāns the river is dammed in the length of 13 km. After 2,5 km we arrive at a turn to Īdeņa and a bridge over the river Rēzekne. From the start point we have managed 8 km. Further we go in the direction of Īdeņa and after short 2 km we arrive in Īdeņa. Īdeņa is like a peninsula that rises above the former flood-lands of Lubāns between the east par of the lake Lubāns and the ponds of Īdeņa. 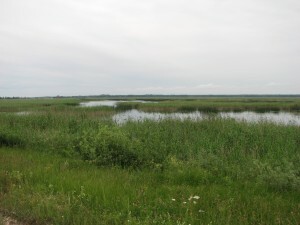 Ponds of Īdeņa are formed on the peatmarsh of Lubāns flood-lands at the same time as the Kvāpāni ponds and are included in the Kvāpāni – Īdeņa pond group. In the cemetery of Īdeņa you can see Īdeņa mortuary. This wooden building was erected in 1896 and is an architectural monument. The mortuary serves for the local inhabitants also as a preaching house. Further we go to the Īdeņa castle mound. Before that in Zvejnieki house you can visit the tourism information office, or start the tour from here. Here it will be possible to leave safely the cars and stay overnight. Behind Zvejnieki houses south-westwards there is an archaeological monument of Late Iron Age – Īdeņa castle mound from where you can see a nice landscape on the lake Lubāns. In 1925 the first person who described and investigated Īdeņa castle mound was Ernests Brastiņš. He found that the castle mound has been ploughed for ages. Different wires, tins and rings have been found when ploughing. A farmer had kept a found silver spoon with round handle and decorated with flowers. But in the course of time it had got lost. Banks, ascents and terraces were ploughed with the lapse of time because the soil here is rather rough, crumbling sand. A white cross is erected not far from the castle mound that can be well seen from the road and closest surrounding. This cross is erected in remembrance of the fallen national partisans and inhabitants of Īdene that were repressed in 1949. Further we go in the direction of Nagļi. 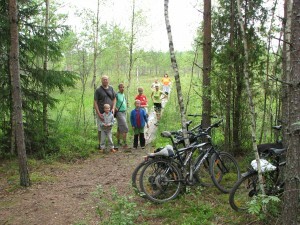 After 4 km we arrive at a wood road that on the right goes into the wood. Here is erected also a sign to the Teirumnīki marsh nature footpath. After another 1 km we have arrived at the start point of the footpath. Totally we have covered 15 km. The footpath in the length of ca. 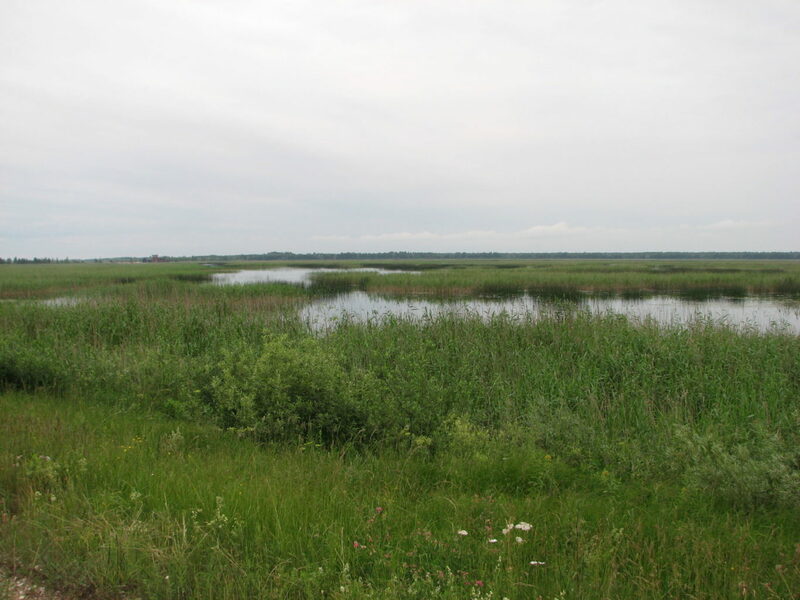 800 m is made in Teirumnīki marsh. 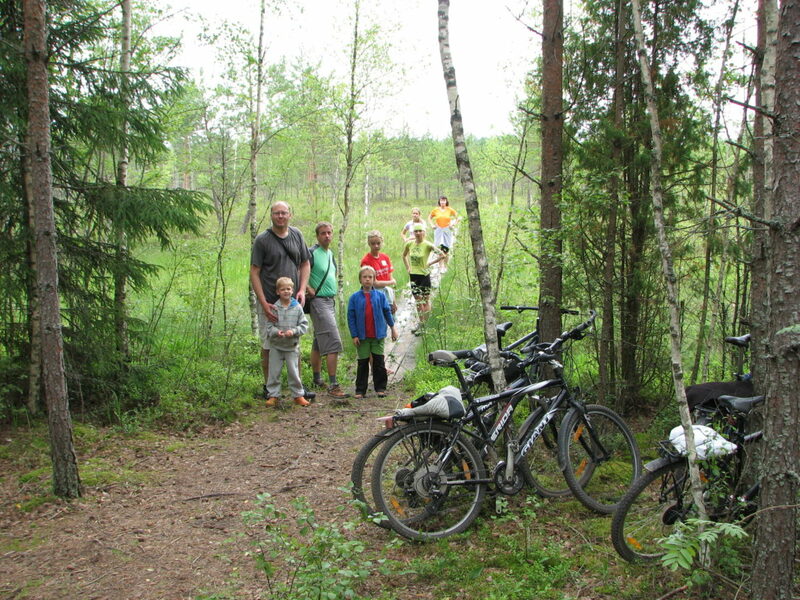 It is possible to leave the bicycles at the beginning of the footpath an along plank-way go to see the scenes of marsh and the flora: bog-moss, cranberries, sundews, cotton-grass, marsh Andromeda, etc. The footpath goes along the south margin of the lake Teirumnīki where three observation platforms are built. From the platforms you can see beautiful sights on the dark water of lake where the surrounding scene reflects like in a mirror. The further span of the footpath goes through a typical open marsh landscape with small marsh dwarf pines. After the traversed marsh we can go along a wood road to the start point of the footpath. The route can be continued by returning on Īdeņa-Nagļi motorway or by continuing to go along the wood road in direction of Nagļi. Since many wood roads cross here, the main thing is to follow the direction and to choose the well driven roads. It is difficult to get lost because the wood area from west is enclosed by the abovementioned way, but from the east Malta-Rēzekne channel. If we choose to return on the motorway then there are ca. 5 km to Nagļi when going from the beginning of the footpath. On the crossroads we turn left and go to Nagļi Catholic Church. If you have planned to shop then you have to take into consideration that the shops are in the part of the village that is behind Malta bridge, it means you’ll have to go more forward behind the Nagļi Catholic Church. The present stone Nagļi St John the Baptist Catholic Parish Church is build in 1862. It was built by then estate manager Nābels that was a Lutheran. Already in the 18th century there had been a slam wood church in Nagļi that was services by Viļāni Bernardine. Art monument – St. Lucas sculpture made in the 18th century is located in the church. Having seen the church we move forward to the bridge over the river Malta, or to be more precise over Malta-Rēzekne channel. To 1966 the river Malta discharged into the lake Lubāns, but when creating the hydrotechnical system of the lake Lubāns, the river Malta was discharged by the channel Malta-Rēzekne to the river Rēzekne. We are at the top end of the river by the sluice that form Nagļi reservoir in the valley of Malta. 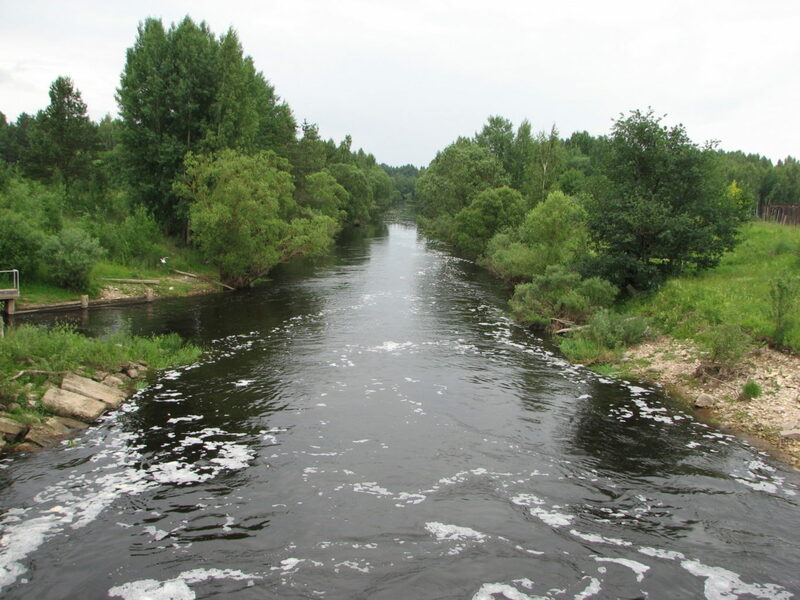 The river Vecmalta forms Īdeņa channel span in the length of 6 km. On the left we can see Nagļi HPP that was commissioned in 2001. From the beginning of the route we have managed 21 km. Further we go back to crossroads where we turn right in the direction of Īdeņa and in the first road we turn left. 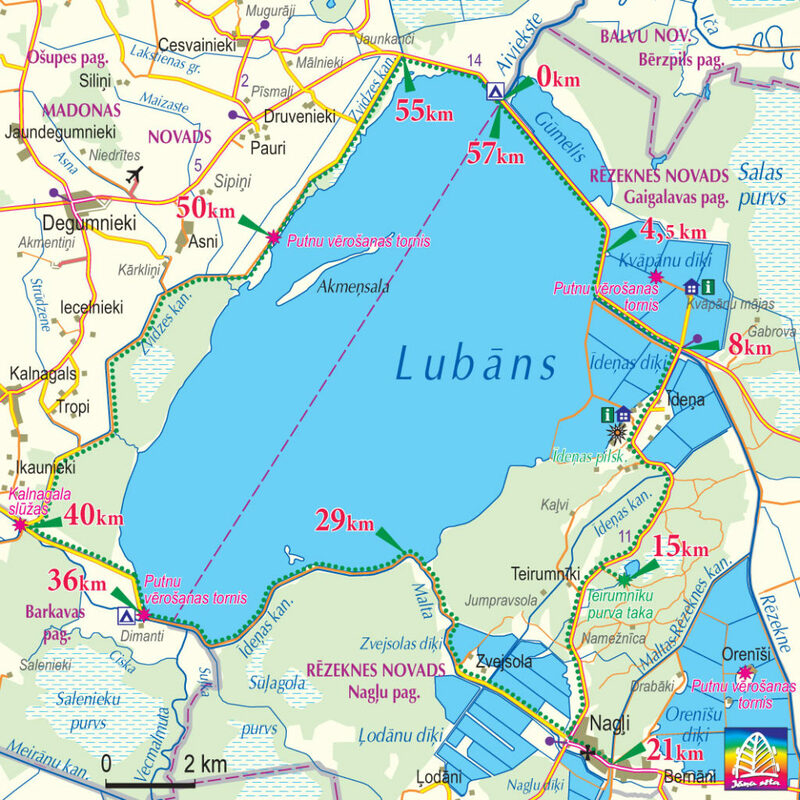 Our route goes in the direction of the lake Lubāns. On the both sides of the road you can see ponds. On the right there are Nagļi ponds, but on the left-Ļodāni ponds. After ca. 3 km we arrive at the turn to Zvejsola house. We continue the route straight and Zvejsola ponds appear on the right. Quality of road surfacing becomes worse and the tourists have to consider that in wet weather you can have to meander among the puddles and slide on clay. In dry weather the road causes no problems. Having covered another 3 km we have reached the lake Lubāns. Further the road gradually turns left and curls along the south margin of the lake Lubāns. At the beginning the bank is mainly overgrown with shrubs, but in separate places you can see nice sights on the width of the lake Lubāns. Īdeņa channel being a part of Lubāns hydrotechnical system winds on the left in parallel to the road. The span of route from Zvejsola house to Dimantiem practically is deserted. The road, separate anglers and fishermen settlements and their huts are the only things that are indicative of presence of people. The deserted span of the route is 10 km long. In Dimanti there is another bird observation tower, here are also tent places and a campsite in the beginning stage. The bird observation tower is built at the very south-west end of the lake Lubāns and here you can observe the scenes of the lake in all its length. Administratively Dimanti is located in Madona county Barkava parish. From Dimanti the road quality becomes better again. From the start point of the route we have covered 36 km. Having managed short kilometre from Dimanti the road turns left and we begin to move away from the lake Lubāns. On the right from road a new channel- excretory duct of the lake Lubāns appears. 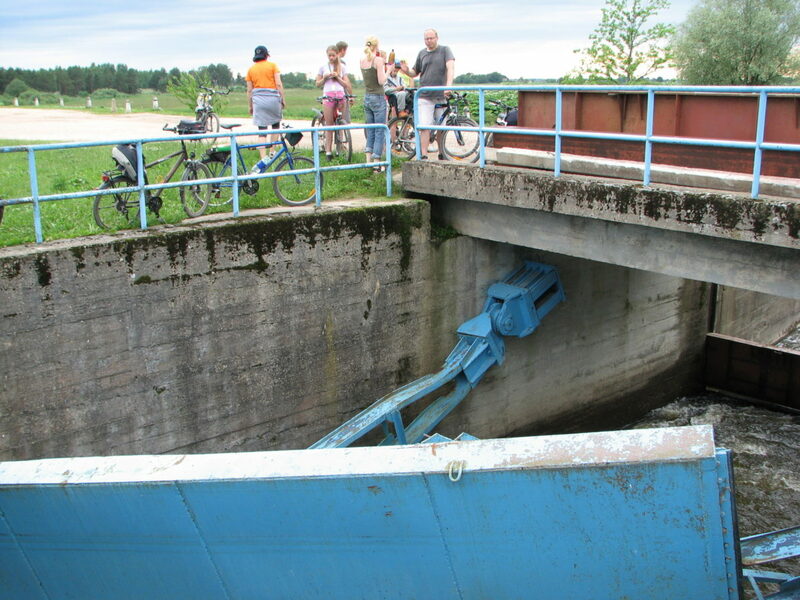 After another 2,7 km we arrive at Kalnagala-Lubāna excretory duct sluices-place where you can see channel and sluice scene not characteristic to Latvia, one of the knots of the huge Lubāns hydrotechnical system. Meirāni channel makes a sharp turn here that the waters of Teicija, Malmuta, Lisiņa and other smaller rivers that earlier flew into the lake Lubāns discharges into the river Aiviekste. Here in Meirāni channel are discharged also waters from Lubāns excretory duct, the river Īdeņa and Zvidziena channel, ad here is also the crossroads of the roads built by the dams. 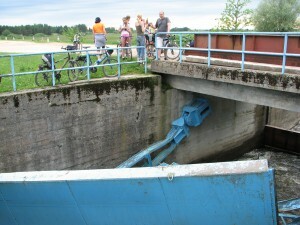 The sluice mechanism thoroughly suffered during spring tide in 2010. Meirāni channel is the first hydrotechnical building that was dug already from 1853-1896 to discharge from the south-west end of the lake Lubāns part of the waters of the lake to the river Aiviekste. From the beginning of the route we have managed 40 km. Further our route goes right along dam road. For ca. 2 km the road is good, but gradually it turns worn-down, but there is no difficulty with going by bikes. On the left from the road we can see Zviedziena channel, but on the right there is a wood. Such landscape can be seen for ca. 9 km, when the road again approaches the lake Lubāns. After ca. another 1,5 km we have arrived at bird observation tower. Here you can observe the landscapes of west coast of the lake Lubāns. Opposite the tower in the lake we can see the only island of the lake Lubāns – the island Akmeņsala. Since there is quite convenient access this place is esteemed by anglers. Further we continue the route along the margin of the lake Lubāns. 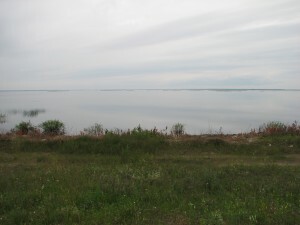 Now the Zvidziena channel is on the right from the road –between the road and the lake. Having gone 5 km we arrive at Degumnieki-Gaigalava motorway. Here we turn right and along the motorway we go to the star point of our route. Having covered 2,5 km we arrive at the start-finish point. The circle is completed. Total length of the route is 57 km.